Your Toronto electric garage door is as good as its opener. If you remove or disengage the opener, the door will only open manually. What electric openers offer is convenience by making overhead door operation automatic! And that’s not all they do these days. With a number of features, they also increase both your security and safety. Their importance signifies the essence of each electric door opener service. From the installation of the opener to its repair, every service must be done with focus on each and every detail. And sometimes that’s not enough either. Let’s say you decide to replace the door. Electric garage door installation involves connecting the existing or a new opener too. This must be done with diligence for the avoidance of future problems, which in turn might make the door unsafe. Nowadays, all openers have sensing protection systems. So the door won’t close on you or the car. The minute the photo eyes sense your presence under the descending door, they will reverse it. But if the sensors are not properly installed or serviced, someone might get injured. Your safety is the prime reason why we offer emergency electric garage door opener repair. When you call to report related problems, we make sure one of the techs from our company will soon come to your aid. And you can rest assured that each and every pro from our Toronto Garage Door Repair is fully trained, qualified, and certified to service your opener. Whether you have chain, belt, or screw drive openers manufactured by Genie, Craftsman, Liftmaster, Marantec, and other big brands, we can repair them. Is the overhead door not closing or opening? Did it suddenly stop moving? Call us to troubleshoot. Even if the opener is not the source for the problem, we can still repair your electric garage door in Toronto, Ontario. Equipped and trained to service any branded door and its parts, our pros can replace springs and cables, fix the tracks, install rollers, align and adjust components, and fix any problem with all parts. 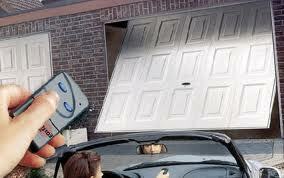 So whenever you are in need of electric garage door repair in the Toronto area, give our experts a call.